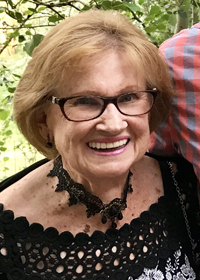 Brigitta Buchholz passed away peacefully, surrounded by her adult children, at her daughter’s home in Des Moines, Iowa on November 5, 2018. Brigitta is survived by three children, Mark (and Nancy) Buchholz of Arlington, VA, Cristina Thomas of Des Moines, IA and Frank (and Heather) Buchholz of Kirkland, WA as well as seven grandchildren - Clayton (and Jade), Bryon, Matthew, Katherine, Tyler, Anderson and Olivia. Brigitta also is survived by her German family, niece Dr. Anita (and Rainer) Mueller-Rohuis of Braachlen, Germany and nephew Klaus (and Claudia) Mueller of Berlin, Germany. Brigitta Lotte-Maria (Grunwald) Buchholz was born at home on October 20, 1934 in Dresden, Germany. Brigitta became a refugee from war torn eastern Germany and migrated with her family through the turbulent separation of Germany, establishing a new home in Bonn, West Germany. In the early 1950s, Brigitta traveled to London and became an au-pair, for a period, for the British Minister of Transport. Upon returning to Germany, Brigitta met Harold Buchholz a Foreign Service officer of the US State Department. They fell in love and married on May 25, 1957. Brigitta became a US Citizen in 1957. Brigitta then began a life of worldwide travel as the wife of a diplomat living, for years, in countries to include Beirut, Lebanon; London, England; Calcutta, India; Moscow, USSR; Zagreb, Yugoslavia; Dar es Salam, Tanzania; and Wellington, New Zealand. This also included extended periods in the Washington D.C. suburbs of Springfield, VA. Notable were years in the early 1970s where Brigitta raised her three children on her own while Harold was posted to the embassy in Saigon, Vietnam during the war. Brigitta was fluent in German, English and Russian; and conversant in French and Serbo-Croatian. She loved diving into the culture of countries she lived in and ensuring it added to her family’s education and life experiences. A strong memory and life event for Brigitta was returning home to Dresden after the reunification of Germany and actually spending time in her girl-hood home. Upon Harold’s retirement Brigitta worked in retail and real estate. Brigitta retired with Harold to the mountains of Western North Carolina in the town of Etowah. Later in life Brigitta and Harold moved back to the Washington D.C. area and built many close friendships in her condo community in Alexandria, VA. Her hobbies included: Mahjong, being a Big Sister in Hendersonville, NC, tutoring language in elementary school and various book clubs. Her love for Classical music made her home always filled with the sound of the Great Composers. Brigitta will be remembered for her wit, cultural intellect and broad views of the world. Brigitta was an amazing cook using recipes she experienced in each of the countries she lived. The love and pride of her family and the bond with Harold during their marriage of 60 years, were the center of her life. The remains of Brigitta will be combined with Harold who preceded her in death in January of 2017. Both will be laid to rest in Alexandria, VA. A portion of Brigitta’s remains will also be returned to her homeland of Germany by her daughter Cristina. Brigitta will be missed dearly by her family and loved by the many lives she touched. Her life was always lived by the motto “Trotz Alledem,” German for “In Spite of Everything”. There will be no public services held.